We were happy to get our hands on a new portable ice maker from Smart Plus Products, their new SPP15AIM. We are always happy to see a new manufacturer enter the ice making market, as it breeds innovation and often, lower prices. 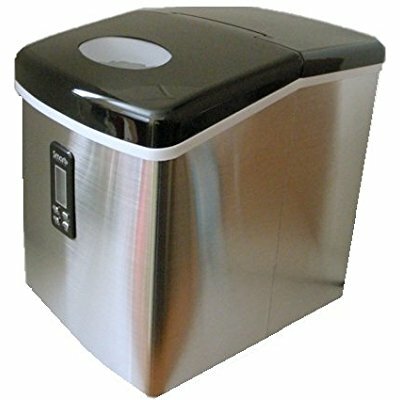 Smart Plus Products just recently introduced their SPP15AIM portable ice maker, and we sourced one on Amazon.com at a great price, so we could bring you another review of a quality, sub $200 ice maker. $170 is a pretty good price on a great machine that produces up to 33 pounds of ice. This makes this a great buy for those on a budget. Fast ice production, and good amount of storage. 33 pounds of ice production and storage of 2 pounds of ice at a time make us happy. And you can have some ice in about 7 minutes, on par with most of the other ice machines on the market. We found the ice storage to be very well insulated so that the ice didn’t melt super fast, but like any portable ice machine, the storage isn’t refrigerated, so ice will melt eventually. There’s no drain on the ice maker, which is kind of nice so you don’t have to worry about leakage and messes. We like the clean design, fancy stainless steel finish, and the lcd readout and electronic push button controls easy to use, and very intuitive. One thing we don’t like, but certainly not a deal breaker, is the weight. At 30 pounds, it’s not the lightest on the market, but if you just use it a home, or an office, etc, then this really isn’t a concern for you. If you lug it around in your travels, boating, camping, etc, then you may want to look for something in the 20 pound range. So, overall, we really like the SPP15AIM ice maker from Smart Plus Products. So far it seems like it’s a well made, reliable ice making machine, and the company does have a “no hassle” one year warranty, if you do run into problems with a doa.